just a badass lady gang of triathletes. That's all. Be Fit. Be Strong. Be Feisty. Together. The SHE TRI.BE Tri Club was created to educate, empower and help women achieve their triathlon goals, and help minimize the barriers of entry into the sport. That's just a fancy way of saying whatever obstacle that is sitting in front of you — be it fear, budget, or otherwise — preventing you from starting to TRI, we'll work with you to ninja strike those away. We believe that a little magic happens when a circle of women come together to raise each other up. The SHE TRI.BE is here to support you through every splash, spin, and step of the way. With us, you won't just swim, bike, and run. You'll swim, bike, run, laugh, connect, dream big, and work hard through one of the most fulfilling + supportive training cycles you've ever experienced. Whether you're just starting out, or looking to perfect your skills, we offer a training environment where athletes of all abilities and backgrounds can thrive together. We train, compete and celebrate our accomplishments TOGETHER. Looking for a badass she-tribe to train with? Please fill out the form below and we will email you all the deets. Kim is a former high school teacher, a USA Triathlon certified coach, an IRONMAN finisher, a military spouse, a mother of two, and a self-proclaimed ordinary anybody who went from couch to IRONMAN because she believed she could. She started triathlon in 2011 and loves sharing her love of the sport with others. She strives to educate and empower her athletes to achieve their goals in a safe and encouraging environment. Kim is passionate about sharing the sport to others, especially under represented populations and works hard to eliminate common barriers of entry into the sport for those populations by partnering with other organizations. She intends to help make Triathlon a lot more diverse and is focused on improving participation among women, minorities and other underrepresented populations; and make more accessible to individuals of lower income a sport in which participation is disproportionately represented by individuals having an average income more than twice the national average. Prefer to train solo? Want a program built around you? Need more personalized attention? Fill out the form below and I will get in touch. Tri With Mom™ is a one-of-a-kind program designed for kids and mothers to TRI together! There are numerous studies that support the fact that when mothers practice healthy lifestyle choices - like being active and participating in athletic activities - their kids benefit. The more active a mother, the more active her child(ren). And the impact is even greater for girls. This 16-week program is designed for new or recreational triathletes aged 7-16 and their mothers, and is taught exclusively by a USA Triathlon Certified Coach. At the end of the program, the team will participate in a team designated race. 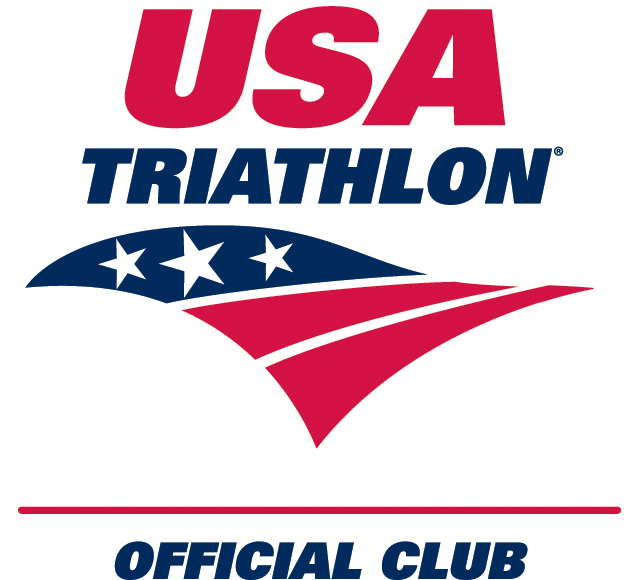 This program is a USATriathlon Sanctioned program. USA Triathlon has reviewed and approved our course curriculum and emergency and safety plans, and our coaching staff all hold current USA Triathlon coaching certifications which includes Adult + Pediatric CPR certification, SafeSport certification, and a NCSI background check. Child triathletes are encouraged to join a local year-round swim club, and will practice one day per week. Mom triathletes will practice two days per week. Practices will be held on Thursday, and Sunday evenings June through September. Practice locations will vary depending on the the practice focus. Locations include Mt. Trashmore YMCA, Blocker YMCA, Norfolk Fitness & Wellness Center, Larchmont Elementary, Maury High School, and Southside Aquatic Center. Previous triathlon experience is not necessary, but triathletes should be able to swim 100 yards (four lengths or two laps) without hanging on the wall or touching the bottom of the pool. It doesn't have to be pretty, and you don't have to have your head in the water the whole time. Athletes should also be able to confidently ride a bike without training wheels, and run or run/walk for 10 minutes continuously. Tri With Mom™ is NOT a learn-to-swim or learn-to-ride program. Appropriate swim apparel (one-piece for girls, jammers for boys) including a swim cap and goggles are required. Tri With Mom® triathletes may use any style bike and must have a bicycle-style helmet with a working chin strap. Running specific shoes are required. Race registration fees and travel costs are not included and are the responsibility of the triathlete/parent/guardian. * Triathletes new to the team will receive a Swag Bag which includes elastic speed laces, Tri With Mom™ branded water bottle, race belt, transition towel, road identification band, and team sticker. Tri With Mom™ membership for new and returning triathletes is $200/child + $350/mom. USATriathlon membership valid through at least August 31, 2018 is required. USAT youth membership (purchased seperately) is just $10 per 12 months for triathletes under 18 years old. USAT 12-month adult membership is $50. Tri With Mom™ triathlon kit (one piece or two piece, tri shorts and tri shirt) and kid's tri kits (both optional) start at approximately $135 for each participant.